The Holy Mother enlightens us on the Akashic Records of the Universe as an invaluable resource to enrich our awareness of karmic relations to the people, places and situations in our lives. Peace Mother shares how Her own karmic connections to Atlantean-Mayan histories manifested on Her Soul Path and imparts shamanic training on how you can access the ethereal records of cosmic knowledge for guidance in your Life. The Holy Mother’s Wisdom Teachings prepare you for the mystical, magical cosmic moments that are part of your soul evolution. As Holy Mother details the lessons She learned that moved Her into union with Her Highest Purpose, your alignment with your Greatest Soul Purpose is fortified. Reading of Peace Mother’s mystical experiences, you gain shamanic insight on how to strengthen your positive karmic patterns to succeed in your Life Quest, as well as liberate yourself from the grip of any negative karma that can block you from your destined initiations into Higher Wisdom. The accompanying Light Activation Artwork relates to the link between Atlantis and the Mayan Pyramids. Reflected in this painting are the connections drawn from the American Prophet Edgar Cayce’s readings on Atlantis and the “Fire Stone” crystal that was carried from the continent of Atlantis to Mexico’s Yucatan Peninsula. Working with this sacred Artwork further opens you up to your own karmic past-life incarnations and the lessons you learned through those lifetimes. You will be inspired as the Holy Mother shares about Her relationship with the Mayan Pyramids, Her electrifying initiation with the Jaguar of Light energy at the sacred site of Dzibilchaltun, and the Temple of the Seven Dolls. Peace Mother also reflects on moments with Her Mayan Teacher, Yucatecan Shaman Don Jacinto, and the precious crystals known as Sastoons, which are used in Mayan Shamanism. As the Holy Mother describes the various views of the Mayan initiations that took place in the past at Pyramid sites such as Chichen Itza, She transports us to parallel realities, encouraging each of us to tap into the Akashic Hall of Records for Higher Wisdom on all history. Holy Mother’s compelling stories masterfully illustrate the importance of addressing our karmic links to the past to understand the depth of our current realities, habits, creative-spiritual gifts and fears. Peace Mother’s spiritual guidance and easy-to-use practical tools provide ways for you to activate your Sacred Memory of the many Holy sites, Healing Temples and Higher Knowledge that your soul has connected with in past-lives. The included contemplations, meditations and exercises are all Sacred Tools for Light Activation to empower you in your desired transformation. You will find that the Sacred Mantras and many other techniques can accelerate your spiritual expansion, to quickly elevate your consciousness. This book is rich with Peace Mother’s compassionate Wisdom Teachings that will encourage you to heroically address your karmic ties with greater awareness, discernment, and dedication to your freedom from karmic suffering. 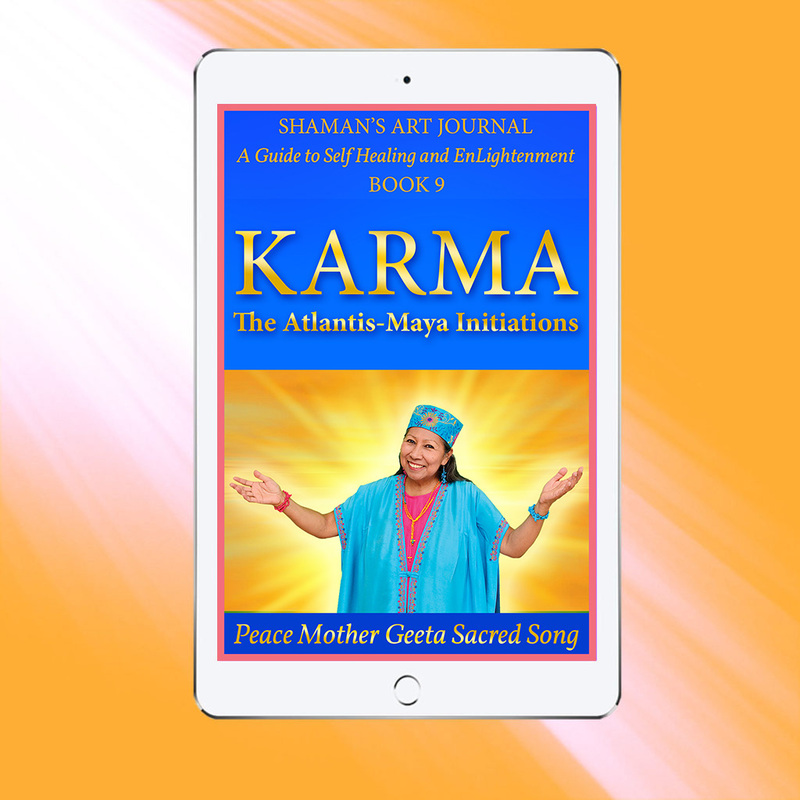 If you desire profound support in activating your Sacred Memory, karmic breakthrough and alignment with your Highest Destiny dive into Karma, The Atlantis-Maya Initiations!